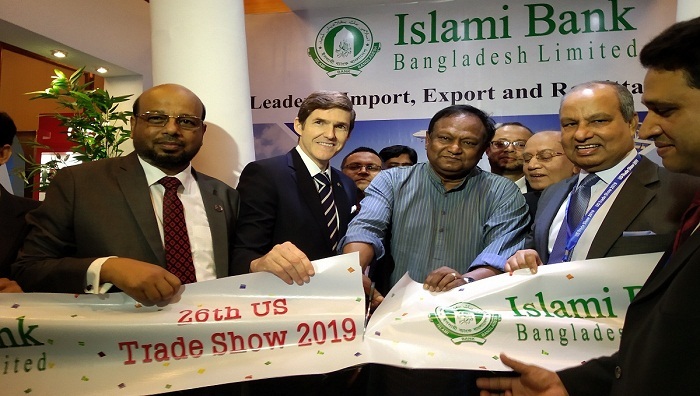 The 26th US Trade Show, 2019 began on Thursday at Pan Pacific Sonargaon Hotel in the capital. Commerce Minister Tipu Munshi inaugurated the three-day trade show when US Ambassador to Bangladesh Earl R Miller was present. The American Chamber of Commerce in Bangladesh (AmCham) and the United States Embassy in Dhaka organized the show to promote businesses between the two countries. AmCham Executive Director Md Shahadat Hossen said a total of 46 exhibitors are taking part in the Trade Show. They are exhibiting their products and services. “There will be two seminars-‘Education USA’ and ‘Business Visas’ on the second and third day respectively. There is $4.1 billion dollars trade gap between the two countries. The show aims at reducing the trade gap,” he said. The show will remain open for visitors from 10 am to 8 pm every day.